Summer Style “Scoop”: Kate Spade New York Ice Cream Edition | StyleCaster We never met a sweet treat we didn't like, and that includes these special ice cream flavors inspired by kate spade new york. 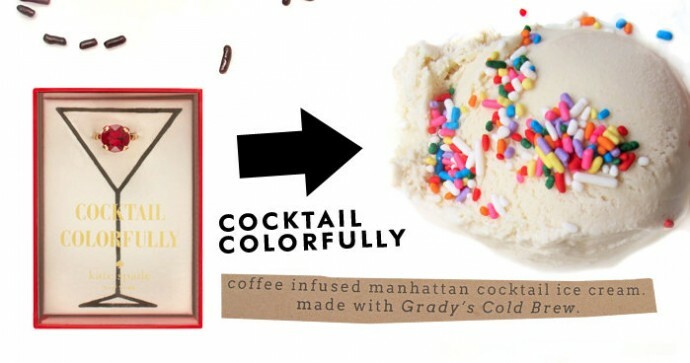 As we told you last weekend, ice cream and fashion go hand-in-hand, so naturally we were delighted when we found out that some kate spade new york flavored of ice cream was floating around NYC somewhere. Created by artisanal ice cream company milkmade, the flavors are a reflection of of some of ksny’s newest products for spring and summer. With names like “Cha Cha Chocolate” and “Pop Art Punch”, the interesting array of ingredients include fresh pineapple, elderflower and Cap’n Crunch cereal. Given our penchant for exotic treats, we guess the only thing missing from this delish collaboration is an espresso flavored cone so we could end everything on an oh-so-sweet note. And while we can’t promise you can get your hands on these particular flavors, the fact that milkmade members get special home delivery makes this one yummy proposition that’s somewhat hard to resist.